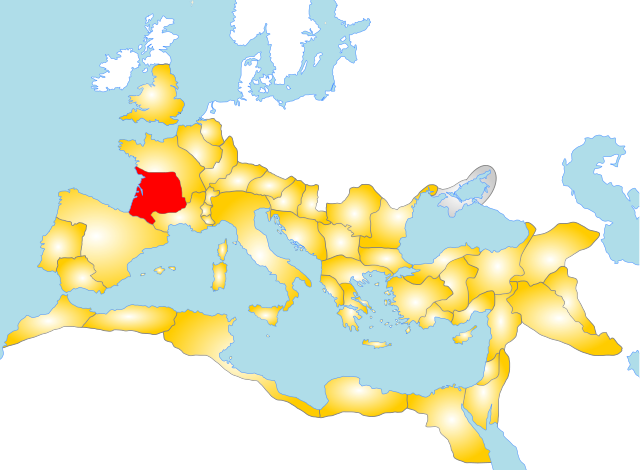 Gallia Aquitania, also known as Aquitaine or Aquitaine Gaul, was a province of the Roman Empire. It lies in present-day southwest France, where it gives its name to the modern region of Aquitaine. It was bordered by the provinces of Gallia Lugdunensis, Gallia Narbonensis, and Hispania Tarraconensis. Aquitania was a part of Gallia Comata, literally meaning ‘long-haired Gaul’, as opposed to Gallia Bracata ‘trousered Gaul’, a term derived from bracae (‘breeches’) for Gallia Narbonensis.